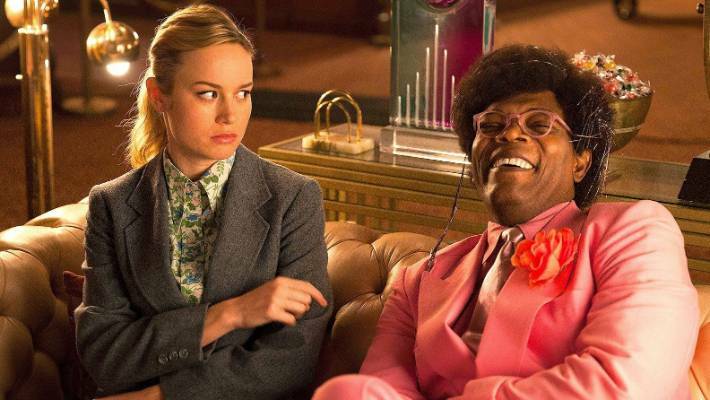 Unicorn Store, Netflix's latest feature from first-time director Brie Larson is sweet, but could use some substance. Kit is an ambitious artist with a flair for glitter-coated projects. After getting kicked out of art school, she gets an opportunity to get a pet unicorn. The movie is fun, but the film offers a cliche approach to opposing corporate life and being true to yourself. Glitter, sparkles, acrylic paint, and rhinestones all make the beginnings of a quirky art project. Too bad, Brie Larson’s Kit couldn’t make a career out of it. In Unicorn Store, from Netflix, Kit is a flunked art student who is misunderstood by her teachers. She moves back in with her camp counselor parents to decide her next move. After an afternoon of deep couch sitting she decides to become a temp for a PR firm to become a “grown-up.” Still quirky, she is in charge of copying ads from magazines until she receives an invitation, several in fact, to The Store. She visits The Store out of curiosity and finds out she can be gifted a unicorn if she is prepared and up to the task. For the next few weeks she prepares for the arrival of her new pet. Unicorn Store is directed by Brie Larson, who is currently the reigning queen of the MCU as her first outing as Captain Marvel has brought in over 1 billion dollars worldwide. Kit’s overtly off-the-wall personality challenges the world she lives in with great force, but often doesn’t make an impact. Larson’s performance is cute and charming, though the character is fundamentally struggling with the line between maturity and a youthful imagination. This gap creates a character that is playing at being an adult while actively connecting to the childhood that has left her. The most delightful add to this film was Samuel L. Jackson. Larson and Jackson have now worked together in four films, including this one, and their chemistry is gold. Jackson’s character, The Salesman, does not take it easy on Kit in the qualifying process and in many ways is the most strict person in her life. The Salesman’s pink suit and glitter hair are fitting to The Store’s elaborate and bubblegum design that resembles the traveling Ice Cream Museum that took Instagram by storm. The look creates an approachable kindness, but he does mean business. From this tone, the pair are great on screen together and their scenes are the best in the film. Larson’s first outing as a director is a soft launch into what can be a promising career beyond her Oscar-winning acting ability. Unicorn Store does not stretch the audiences awareness or challenge much, but does key-in on the idea that you need to be true to yourself. While a glitter-coated existence sounds fun, the film criticizes adulthood. She seems to think the world should work harder to understand her and not have her better understand the world. Because of her charm and candy-coated defiance, her stubbornness is endearing. Larson does have a way of bringing sunshine to the screen. Her day job offers a glimpse at the “real world” that is bland and bleak. Her coworkers are rude, her boss gets too close, while male coworkers are celebrated for their talents while clearly not working very hard. The anti-corporate stance is a drastic counterbalance to her flair. Because the story is so critical of office work it is easier to buy into her fun-filled fantasy as she creates a pitch that will add lots of sparkle to a vacuum cleaner PR campaign. Her pitch becomes her big moment to triumphantly tell the world who she is and why they need her, but ultimately she is dismissed for being too much. Although Kit never wavers in her belief that unicorns are real, the audience is positioned to question her thinking. By the time she reveals her plans to her parents and carpenter/love interest, Virgil, they all think she is crazy. Virgil walks away thinking she was scammed and wants to go to the police. Her parents just question her sanity and try to guide her to a new life plan by giving her enough room to breathe without removing their watchful eye. So, is it real? We have seen The Store, we have met The Salesman, but is she really going to get a unicorn. Has it all just been a dream? It is real. Kit does get to meet her dream pet, although after all of this, she doesn’t keep it. In the singular moment of character growth, she offers the women next in line to receive this gift. Her new found confidence to persevere, despite her critics, moves her to realize she doesn’t need a unicorn anymore. Was it worth the trip to The Store? Overall, Unicorn Store is a cute, glitter-filled bath of color in a bland world. Although the story line looks original, the script never strays from a classic three-act structure. Further, the film doesn’t move the needle with its thinly masked comments on the current state of the status-quo challenging millennial generation. The film should have been a little less about how to qualify for a unicorn by proving the ability to buy hay, but shift the focus to personal growth and design a story to better show Kit how to bring her sparkle to the bland world around her. Unicorn Store makes you smile and brightens up your day while working as a soft, sweet reminder of how to never forget that everything that glitters is gold.